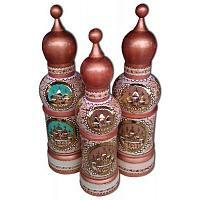 Authentic Khokhloma bottle case handmade in Russia. It is hand turned from linden wood and hand painted in the traditional Khokhloma style. This bottle holder opens in the middle to fit a standard 0.5 l vodka bottle or a bottle of similar size. May also be used as a treasure box. The bottle case is coated with up to 5 layers of crystal clear lacquer. It would make a great gift or a nice addition to dinning accessories in your kitchen. Height: 17.7" (45 cm). Production time: up to 7 business days.